After touring the South, Greeley was formally welcomed home to New York on June 12, 1871, with a serenade and greetings at the Lincoln Club Rooms at Union Square and by an audience of thousands on the street outside. Speaking on a platform erected in front of the Club Rooms, Greeley declared, “I desire no office, and though I never shall decline any nomination that has not been given to me—[laughter] I shall certainly seek no office whatever [applause].” His carefully phrased observation, “I never shall decline any nomination that has not been given to me” was clearly open to easy misquotation and misinterpretation. In fact, that entire section of his oration could be mistaken as a petulant declaration of independence from the Republican Party he had done so much to establish. Greeley went on to speak of his experiences in the South, the evils of “thieving” carpetbag rule, and urban corruption in the North. 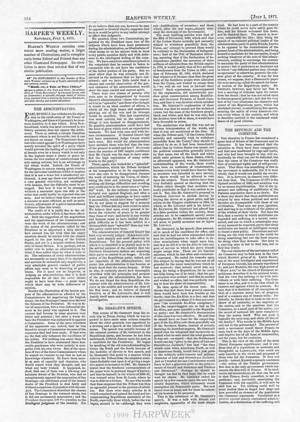 For the editor, it was time the nation left behind the politics arising from the Civil War.